As a nation of animal lovers, it’s no surprise that many Australians wouldn’t consider a retirement home or village that doesn’t allow animals. Not only are cats, dogs, and other furry and feathered friends a wonderful source of companionship and entertainment, they also offer specific benefits for seniors. From taking your dog for a walk to visiting the vet with your budgie, pet ownership increases the opportunities for socialising with others. Petting a soft, purring cat or a happy, loving dog doesn’t just feel good – studies have shown that this simple act can also help to lower blood pressure. Pet ownership is an easy way to maintain fitness throughout retirement. Dogs in particular encourage daily walks, but many animals require simple at-home tasks such as cleaning and playing that help to keep owners moving. Owning animals can help to improve overall mood and morale, as well as reduce the symptoms of loneliness and depression. The thought of downsizing your home for retirement may feel overwhelming. It’s a big step, and it can be emotional, but for many people it’s also a path to greater freedom, improved quality of life, and peace of mind. Pets can help owners to feel more alert than non-owners, as looking after another living being takes a lot of attention and care, such as ensuring there’s always food and water for them, keeping them happy with toys and entertainment, and taking responsibility for their health. As studies on the dynamics between pets and their owners are continuing around the world, researchers are finding new and incredible evidence of how animals can improve the lives of humans. Not all retirement homes and communities allow animals, and even then, those that do often have restrictions on the types and sizes of pets you are allowed to bring with you. However, there are some that offer pet-friendly homes, so if bringing your furred friend is a priority, be sure to ask the village manager when you visit. Will the village allow new pets or only existing pets? Are there restrictions on the types of animals allowed in the village? Are there any facilities on site or nearby that would be suitable for off-leash time for dogs? As well as asking these questions of a village manager, it’s also important to ask yourself questions about how well the community would be suitable for your pet. For example, would your pet be suited to apartment-style living without a large outdoor area? Is the village right next to a busy road that could be dangerous for animals such as cats? 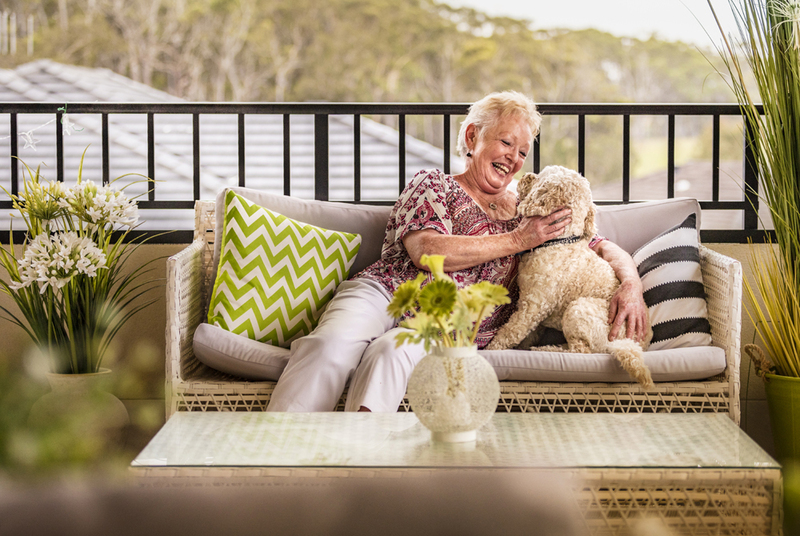 One of the handful of pet-friendly retirement villages in NSW is Halliday Shores. Not only are animals allowed in our villas and homes, pet ownership is actively encouraged, as we are aware of the plethora of benefits afforded to seniors thanks to their cute two- and four-legged friends. You are welcome to purchase a new pet after you arrive, and there are very few restrictions on the types of animals you can bring. You can even arrange on-site vet visits for your animal and with other pet owners in the community to minimise costs. We’d love to welcome you and your pet to the community at Halliday Shores, so you can both make the most of your retirement years together. Give Janine a call on 1800 223 733 to talk about pet-friendly options on site. Previous PostDon’t miss the Taree Easter Powerboat Classic! Next PostOpen Day Free BBQ Lunch - Halliday Shores Retirement Village, Thursday Feb 21.